Late last year, the City of Los Angeles celebrated the installation of its first Continental Crosswalks in Downtown Los Angeles. These striped crosswalks are more visible than traditional crosswalks and the road markings make clear to motorists that they need to stop behind, not inside, a crosswalk. However, a motion by Council Member Mitch Englander, seconded by new Council Member Gil Cedillo, charges that sloppy work by contractors is making the new crosswalks more dangerous. By gouging out the old markings and replacing them with new ones, that the city is leaving confusing road markings and uneven streets. This complaint also applies to some of the 137 miles of dedicated bike lanes the city has painted in the last two and a quarter years as well. The motion will be heard at today’s City Council Transportation Committee Hearing. “With over 80 miles of bike lanes installed in the City of Los Angeles last year, it is critically important these bike lanes are installed properly, and with the safety of cyclists as our highest priority,” said Englander in a statement to Streetsblog. Not surprisingly, LADOT doesn’t agree with the Council Members point of view. Their report, available here, points out that removing road markings will result in some level of damage or scarring no matter what method is used to remove them. 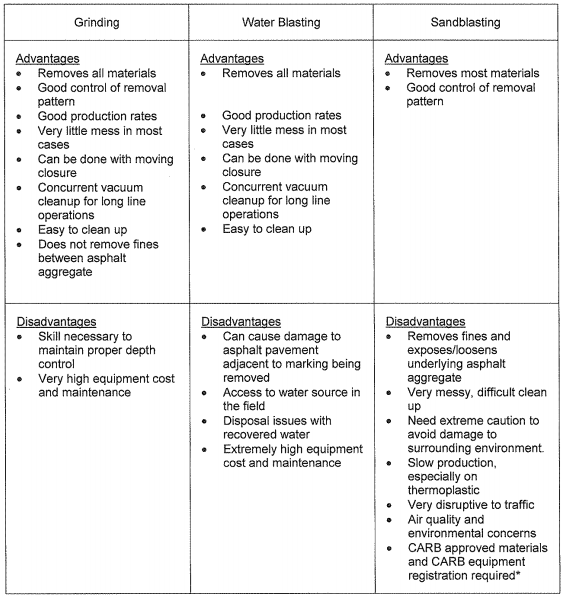 Sandblasting, the marking removal treatment preferred in the Englander motion, has several drawbacks. This requires a permit from the state’s Air Resource Board and is actually the least effective method of the three regularly used by transportation agencies. However, the LADOT response only answers one of the two complaints head-on. One complaint is that the city isn’t using the best method to remove old road markings when better ones are going in. The second complaint is that the work being completed by LADOT contractors is shoddy and creates and unsafe environment. The Department does give the qualifications of the contractor they use, but doesn’t ever actually say anything to defend the quality of their work. The Englander motion states, “A flagrant example of this situation is found along Corbin Avenue south of Devonshire Street.” With that section of road being singled out, I packed the kids into the official station wagon of Streetsblog and took a field trip. We walked up and down Corbin Avenue, holding the hand of a three year old and wearing a nine month old in a stroller. On one hand, the old markings were plainly visible, both for the bike lane and the Continental Crosswalks. The road was definately in slightly worse shape where the new infrastructure was painted. On the other hand, the slightly bumpier road didn’t stop me from pushing the stroller across the street. Sammy, the three year old, didn’t fall into a road crater. I would still prefer to cross at a Continental Crossing with some roughed up road conditions than in a traditional crosswalk with a pair of thin lines designating the pedestrian crossing area. As for the bike lanes, we walked about a half mile in each direction, Sammy was a trooper, and I didn’t notice anything too out of the ordinary with the lane. Of course, it could have been a different story riding in it. New pedestrian crossings and bike lanes are supposed to be about more than just creating a safe place for pedestrians and cyclists to use the street. It’s also supposed to encourage more people to walk and bike for transportation. In that sense, the new crosswalks on Corbin aren’t going to work. The roughed up gravel and bumpier road sends a message to those walking that they aren’t important. Remember, the rest of the road is actually smoother than the crosswalk. That’s a little weird. Weird enough that people are calling Council Member Englander’s office to complain. If the city can find staff or contractors that can do a better job installing these crosswalks, and bike lanes, and do less damage to the road, they should…even if it costs a little more money. After all, it’s one thing when people complain about a bike lane because they want more room to drive. It’s another thing altogether when the bike lane is so poorly installed that cyclists were better off without it in the first place. The same holds true for crosswalks. It’s a bit hard to tell what the issues might be from looking at those photos. I can see a little bit of roughness on the very edges of the crosswalk, where the old lines had been, and some slight cracking on the far left of the first image. But no matter what they do to these asphalt streets, it’s still much better than the long cracks in the direction of travel in the bike lanes on concrete streets (in my neighborhood, Griffith Park Blvd is a bad one, but Myra also has some issues). Can someone explain the point in even removing the old lines? Many cities use both sets of lines as a standard – whats the point in removing them for the conversion? From what I understand, continental crosswalks offer superior visibility over ‘ladder’ crosswalks that include the transverse markings — drivers detect them sooner due to the higher contrast between the paint/thermoplastic and the bare road surface. That was sort of the point. Yeah, it’s rougher and uneven but it’s not like it was tipping the stroller over or anything. The issue is whether or not the city can do a better job than it is making the pavement easier…unless this is the first salvo in an effort to have them stop painting bike lanes. If the city is doing it in house they could provide better employee training. If it’s being done by contractors, they have to take the lowest bid. Of course, the city has the right to reject poor quality work, but it would probably not be worth the legal costs. Relative to the many city streets in need of resurfacing, this seems like a pretty minor issue. The city identified intersections with the most collisions over the past decade and installed these crosswalks – as they have an effect in bringing down the number of collisions. This is, to me, a piece of windshield legislating. Go for a walk in your districts, gents, and you will face some serious hazards. The feigned attempt to address some problems with the right of way underscores a serious blindness to the horrible situation for those riding and walking (nevermind using a wheelchair, walker, or stroller) in your districts. Get real. Frickin’ rippled asphalt is the least of our worries. You misunderstand what Im saying. Look at my google maps example. I said LEAVE the old marking and just add the new ones. Of course they offer better visibility. However leaving the old lines instead of grinding them does not reduce visibility. True. It just leaves you with inferior visibility compared to grinding the transverse markings away. How does leaving the old lines cause worse visibility in any way? Especially when that design (two across, then the stripes) is standard in many places? You really prefer the gravel and holes? That’s what the FHWA studies say: ladders are less visible than continental. I never said I preferred anything. The new continental crosswalks are great. But what we need are RED crossing lights, not those silly amber leds, and we need serious pedestrian education. Blissfully ignoring the laws of physics and arrogantly expecting drivers to bow down to your noble act … will not lead to a long and happy life.